Different level flutes come with different features that are meant for players at that level. Beginner flutes are made so that it is easier to make a sound. Professional flutes offer more resistance and special features. Today, we are going to look at some of the most common specs, what they mean, and who they are for. Remember: no two flutes play the same, and no two players play the same. These flutes have the fewest amount of add ons; the specs are pretty standard across different brands. That is part of why the cost is lower for beginner models that intermediate or professional flutes. 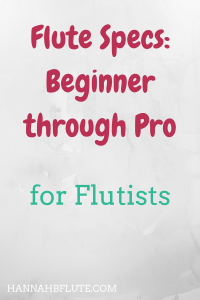 Beginner flutes are silver plated throughout the entire flute. Silver is expensive; by plating a flute, you can cut cots while still having the sound of a full silver flute. Beginner flutes also come with a C footjoint. Flutes with C footjoints have a shorter tube and one key fewer than flutes with a B footjoint. These flutes go down to middle C rather than the B right below middle C. The lack of a low B is not a big deal for most beginners, and the lighter weight makes holding the flute easier. Student flutes come with closed hole keys. Keys with open holes in the middle require a more refined hand position. Starting out on a flute with closed holes allows the player to focus on other things at first, but hand position is still important. Intermediate flutes go by many names. Sometimes they are called step up flutes or mid level flutes. No matter what you call them, these are the flutes between beginner flutes and professional flutes. They offer more professional specs while staying budget friendly. A handmade headjoint is one of the features that sets apart intermediate from beginner flutes. Beginner flutes are almost always factory made. The bodies of most intermediate flutes are also factory made. Intermediate flutes will have a handmade headjoint, though. Another feature seen on many intermediate flutes, at least in the United States, is open holes. Open holes, while not necessary, allow the player to start learning certain extended techniques, like quarter tones. The third common spec for intermediate flutes is a B footjoint. While this is less common in Europe, North American flutists looking to upgrade will probably find a flute with a B footjoint. The last spec that is standard with most intermediate flutes is a higher silver content. Whether it is a silver headjoint or a silver headjoint and body, intermediate flutes contain more solid silver than student flutes. It is at the intermediate level where you have the ability to start customizing your flute. Student flutes come as is, but intermediate flutes offer extra features that can help with certain notes and fast passages. The first common option for intermediate flutes is the split E or the G disc. Both of these options fix the same problem: the high E. A split E key closes the lower G key. This flattens the pitch of the high E and allows for more control and less cracking. The G disc takes a different approach than the split E by placing a “donut” in the lower G tone hole. Doing this allows lowers the pitch on the high E without making as much of a sacrifice as the split E.
The C# trill key is yet another common option for intermediate flutes. The key is placed onto the flute between the thumb key and the trill keys. It facilitates C# in both trills and as the main note. The biggest thing that professional flutes have on intermediate flutes is that they are fully handmade. Professional flutes are also more expensive. Aside from that, there are not a ton of differences between intermediate and professional flutes. Professional flutes are slightly more customizable. They come in different metals, even silver plated. Professional flutes are priced highly for a reason: they are for professionals and serious amateurs. These flutes are not for the faint of heart. There are two specs that you will likely only find on professional flutes. Those two are: solid silver keys and soldered tone holes. Most professional flutes are all silver, including the keys. While some lower cost professional flutes have plated keys, solid silver keys are just as common. Are they necessary? It’s up to you on whether you want to spend the money. In the professional flute world, there is a long running debate between drawn and soldered tone holes. Drawn tone holes are created by “drawing” the silver from the tube to create the tone holes. Soldered tone holes, on the other hand, are made separately from the flute and then soldered onto the tube. Professional flutes come in all sorts of metals. You can find silver plated flutes, sterling silver flutes, gold, and even platinum flutes. Professional flutes can also be found in different types of silver, like the darker Britannia silver. This is just a short list of all the different specs that you can find for flutes. Did I leave out any of your favorite flute specs? Leave a comment below, and don’t forget to subscribe if you haven’t already.